If you don’t know how this decision-making matrix works, see explanation and example below the table. 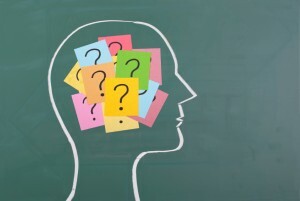 This decision-making tool is inspired by Pugh decision-making matrix. 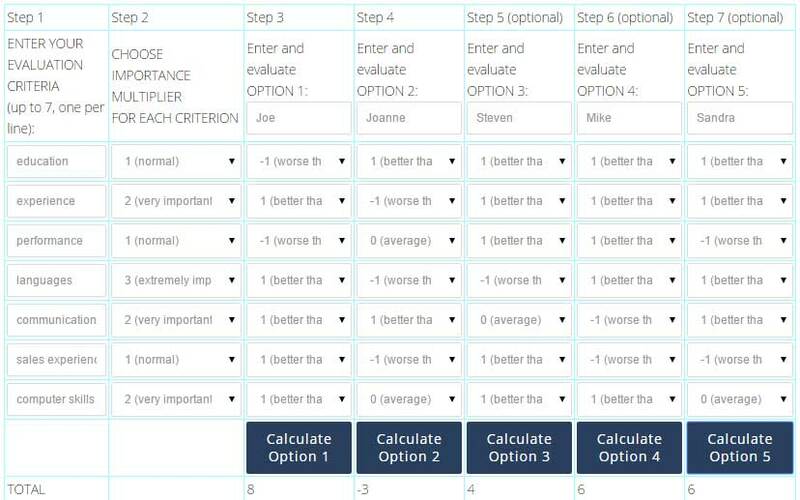 This simplified version allows you to evaluate up to five options (or solutions) using up to seven evaluation criteria. When evaluating your options, you should keep in mind your minimum acceptable standard for each criterion. That standard is referred to as “average”. Now see how each option/solution compares against this “average” standard. Is it better? Is it worse? Is it same? Another important thing you will have to decide on is how important each particular evaluation criterion is. You may have seven categories (or criteria), but some of these categories will be more important than the others. The importance of each criterion is its “weight”. In our version, it’s expressed by a number on the scale of 1 to 3 where 1 is “normal”, 2 is “very important”, and 3 is “extremely important”. This will be later used as multiplier. Setting the weight (or importance) correctly is critical because if you don’t get that right, you will end up with unreliable results. If all criteria have about same importance, you should make sure that importance column reflects that. Setting one of the columns to “2” means that a score is multiplied by 2. In other words, this means that this particular criteria is twice as important as other criteria with “normal” importance (“1”). When you complete entire table, you will get a score for every option/solution you entered. The option/solution with the highest score will be the winner. Generally, anything with positive score is an acceptable solution because it satisfies your most important requirements. Anything with negative score should be dismissed. She decides on her standard requirements such as a somewhat relevant education, one year of experience in the field, decent past performance, ability to speak at least one foreign language, having acceptable communication skills, a little bit of experience in sales, and basic computer skills. Martha is willing to hire someone who meets these requirements and is not willing to settle for anything less. She also decides on importance of each particular skill on the scale of 1 to 3 where 1 is normal and 3 is extremely important. This number will be used as multiplier when evaluating the candidates. In this example, Joe scored the highest so he is the winner (8). Mike and Sandra come second (6). Steven (4) scored a little low comparing to Joe, Mike, and Sandra, but Martha will not dismiss him completely since he still managed to score positive. Joanne (-3) is not only the last; she also scored negative which means she really doesn’t have what it takes to get this position. This decision-making matrix can be used for professional and personal decisions. You can use it to decide where to live, what to buy, what career to choose and who to marry. You don’t have to fill all seven criteria, and you don’t necessary need five options (or solutions). You can compare as little as two options with seven or less criteria. Any information you enter remains private — we do not receive your data. All calculations happen in your browser only and will be gone once you close or refresh your browser window. If you would like to learn more, here is a video that explains how Pugh matrix work (although a little different version).